Neuroscientist Sarah Laszlo wants to understand what’s going on in children’s brains when they’re reading. Her research may untangle some of the mysteries surrounding dyslexia and lead to new methods of treating America’s most common learning disorder. Laszlo, who joined Binghamton’s psychology department in 2011, recently received a five-year, $400,763 grant from the National Science Foundation’s Early Career Development (CAREER) Program, the agency’s most prestigious award for young researchers. The funding will enable her to conduct a five-year brain activity study of 150 children with and without dyslexia. Rather than lumping all children with dyslexia into one group, as many previous brain-imaging studies have done, Laszlo’s project will help to establish types and degrees of the disorder. 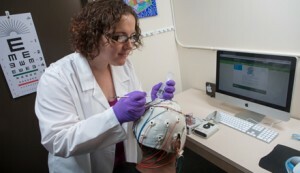 Her lab uses electroencephalography, or EEG, as a non-invasive way to measure the electrical signals sent between brain cells when they’re communicating with each other. Study participants — kids in kindergarten through fourth grade — wear a cap outfitted with special sensors while playing a computerized reading game. These scans produce massive amounts of data: The cap’s 10 sensors collect readings 500 times per second for 45 minutes. That’s one reason that brain activity studies are expensive and time-consuming. It’s also the reason that a study of just 150 children is the largest study of its kind. Why study this disorder in particular? Laszlo notes that there are significant, sometimes lifelong consequences of growing up with dyslexia. Many dyslexic children don’t do as well in school as they might otherwise, which limits their career opportunities. Some also encounter social problems. “This has the potential to help a lot of people,” she says. Participants in Sarah Laszlo’s Reading Brain Project play a computerized reading game while researchers measure their brain activity. Children in kindergarten through fourth grade are eligible for the Binghamton University study and will receive $50 or an equivalent gift for their time. To sign up your child, call 607-269-7271 or e-mail readingbrain@binghamton.edu. For more details, visit www.binghamton.edu/reading-brain.